The Lawn-Boy brand has long been synonymous with quality, and Lawn-boy's quality standards begin with high quality components, like this wheel assembly. 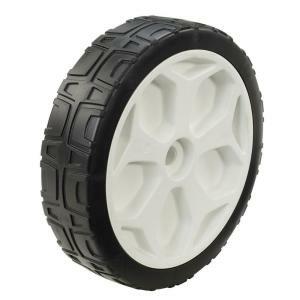 With a wheel hub made of durable polypropylene, this 7 in. wheel assembly is a long-lasting and highly functional replacement for 21 in. models. This wheel assembly offers a capped tire with a stylish 5-spoke hub, and an aggressive tread to minimize slip. Tbook.com crawls the web to find the best prices and availability on Lawn-Boy and related Tools and Hardware products like Toro Replacement Front Wheel for Lawn-Boy. For this page, related items include products we find that match the following keywords: "Lawn-Boy" at our vendor partner Home Depot. Toro Replacement Front Wheel for Lawn-Boy is one of 16 Lawn-Boy and related products listed in the Tools and Hardware section of Tbook.com If you have any questions on this product, please give us a call at 734-971-1210 during the hours of 9am - 5pm EST for assistance. Thank you for shopping at Tbook.com, the Internet Department Store!